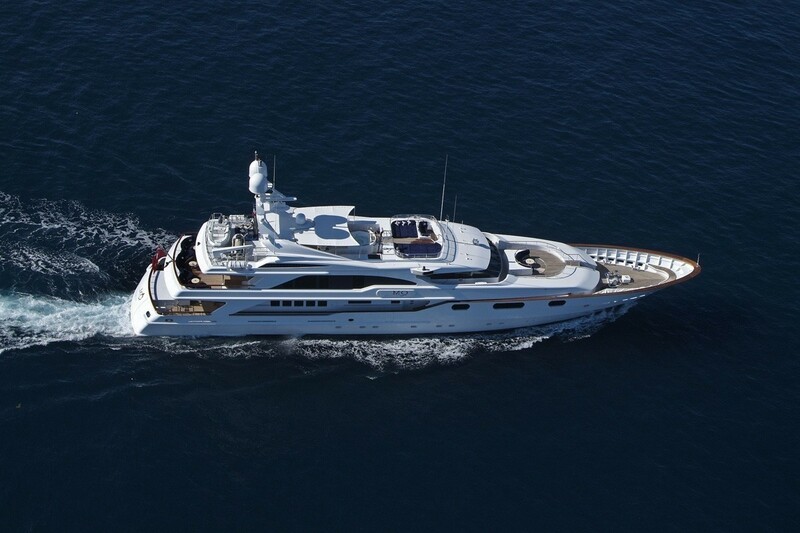 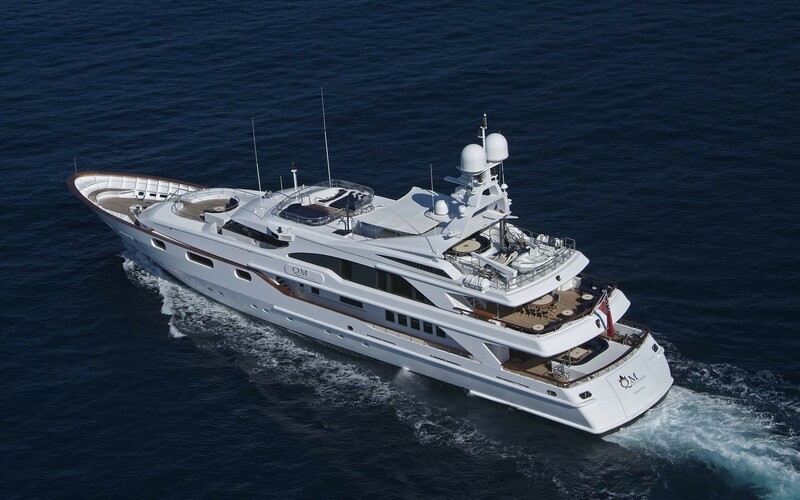 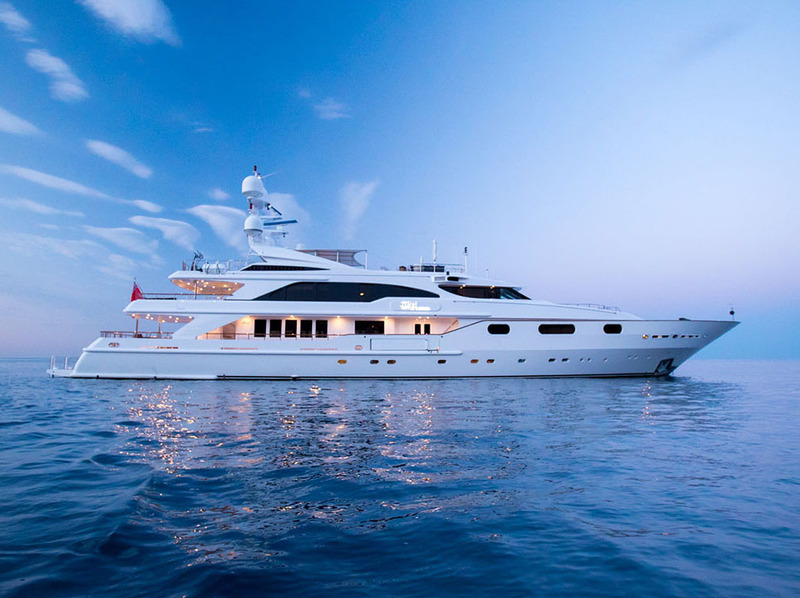 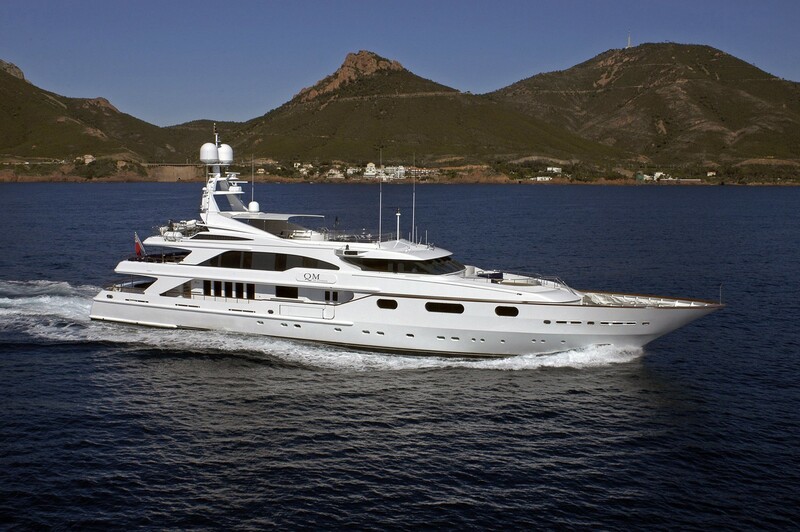 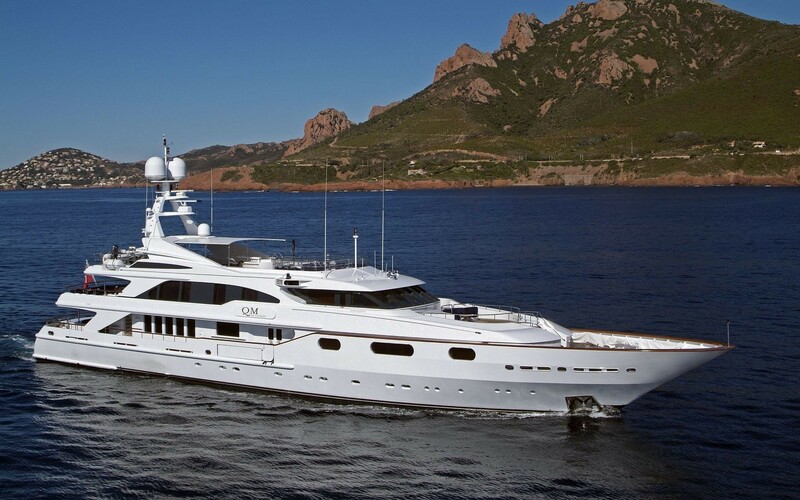 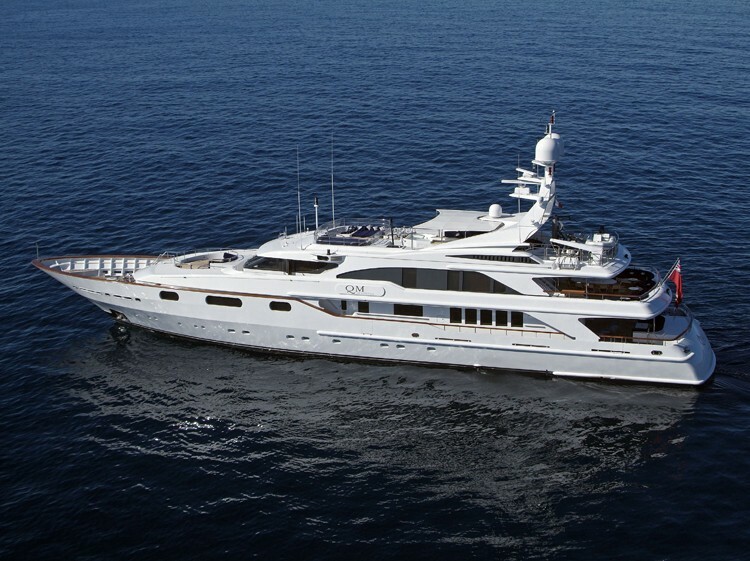 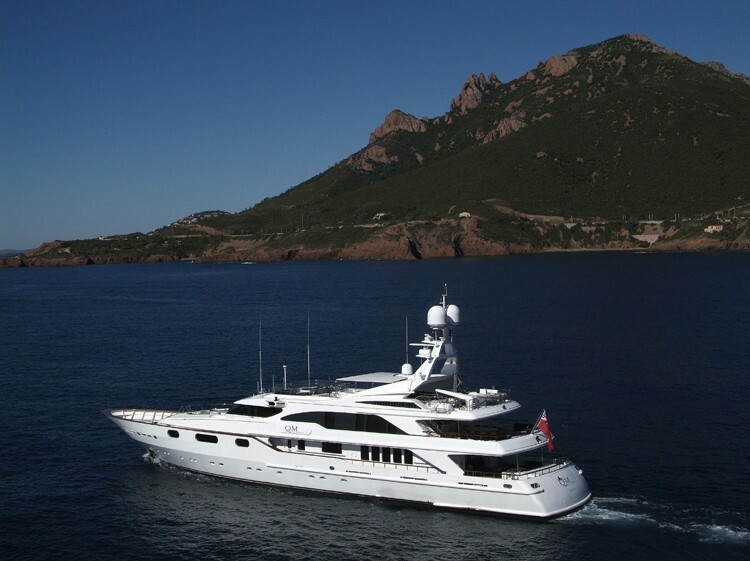 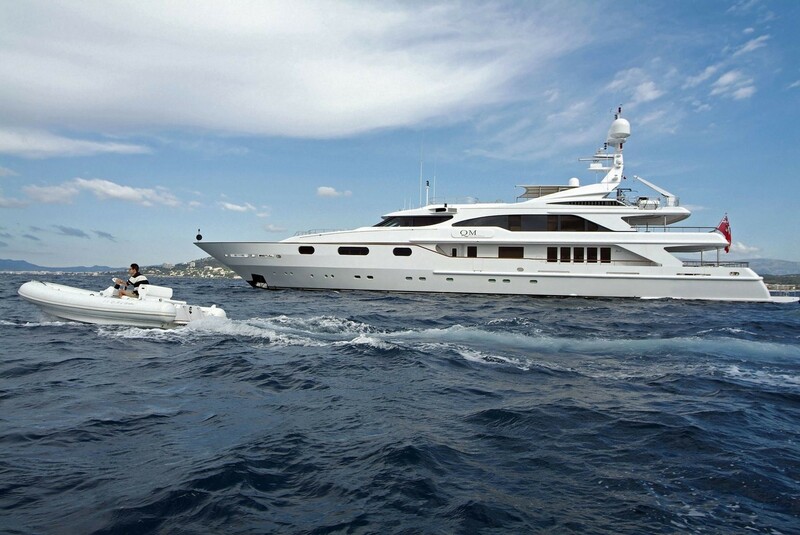 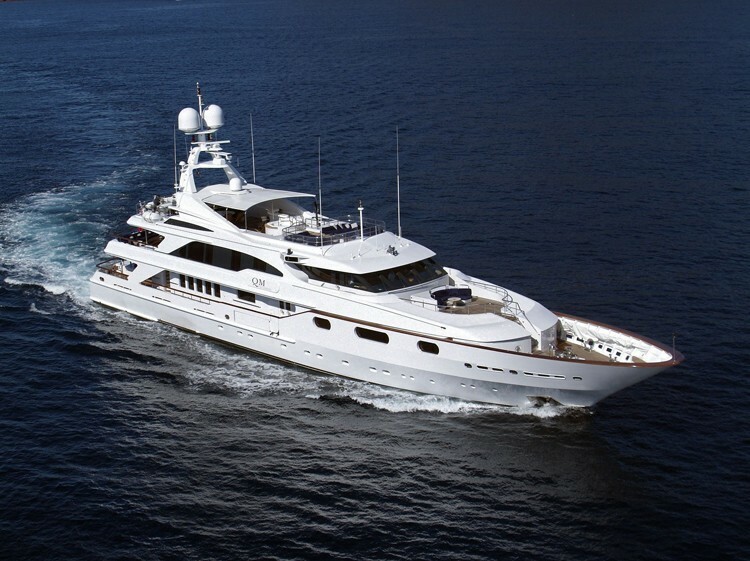 Built to the highest standards by the Italian shipyard Benetti in 1998, the 49,9m luxury motor yacht AIR (Ex QM OF LONDON, QUEEN M) represents a fantastic charter yacht belonging to the beautiful Benetti Golden Bay series. 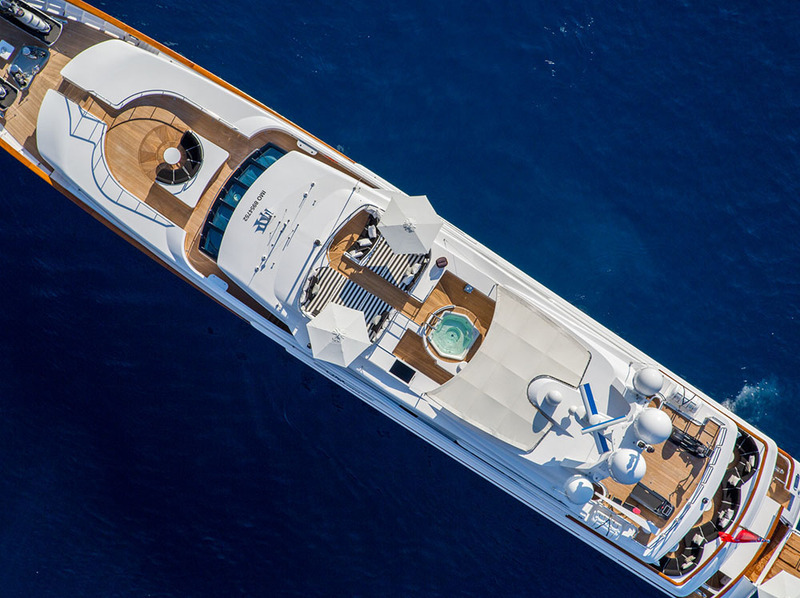 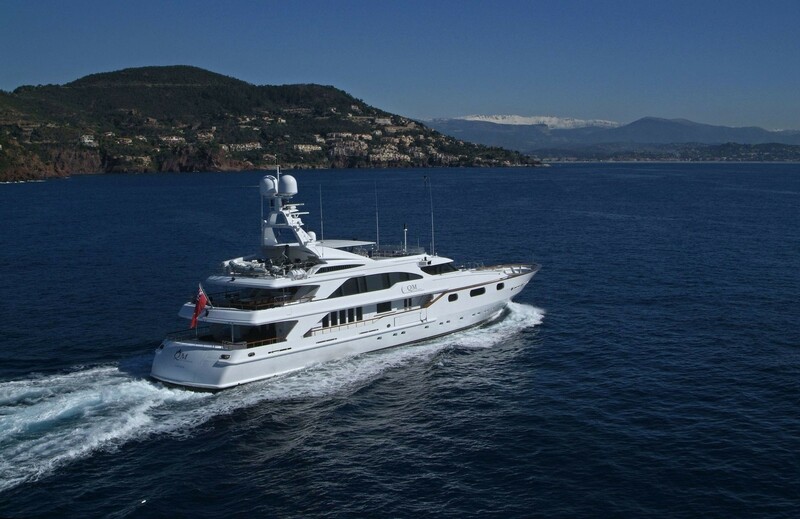 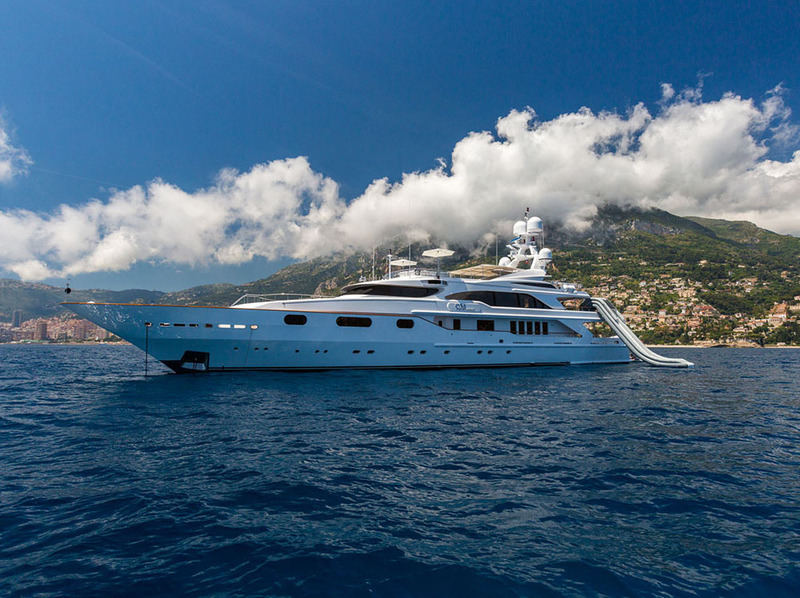 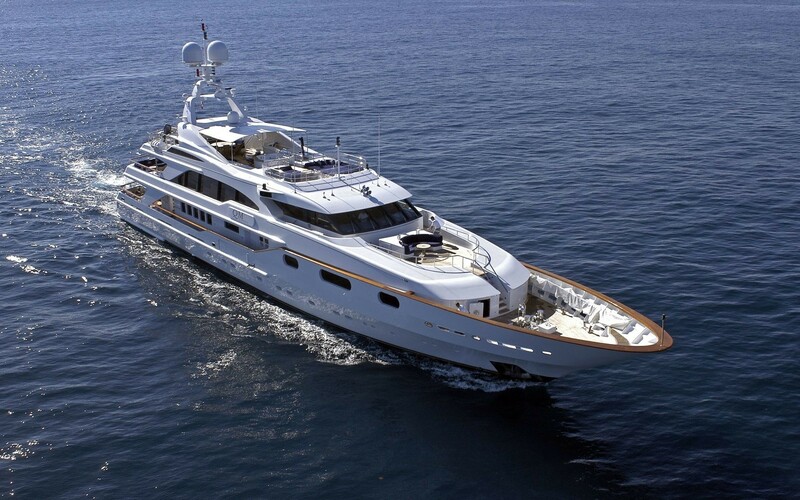 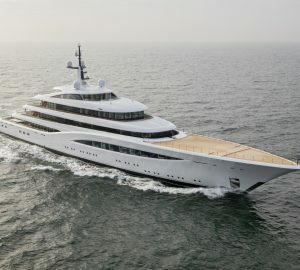 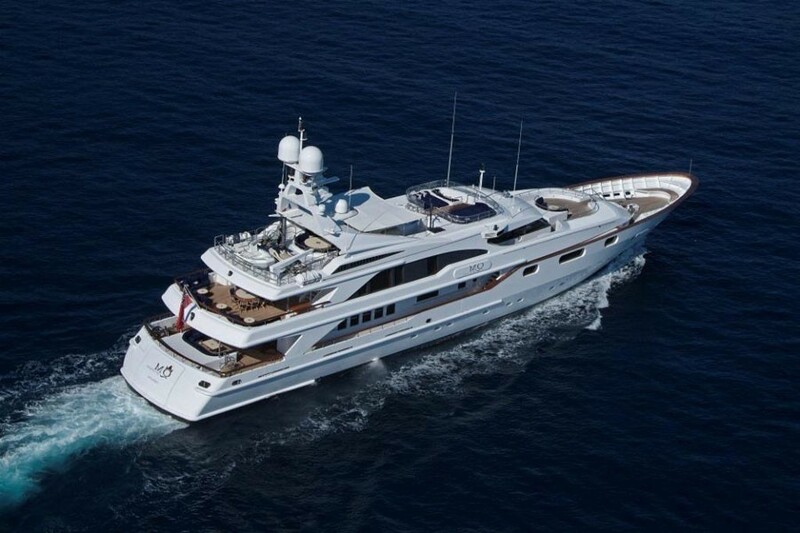 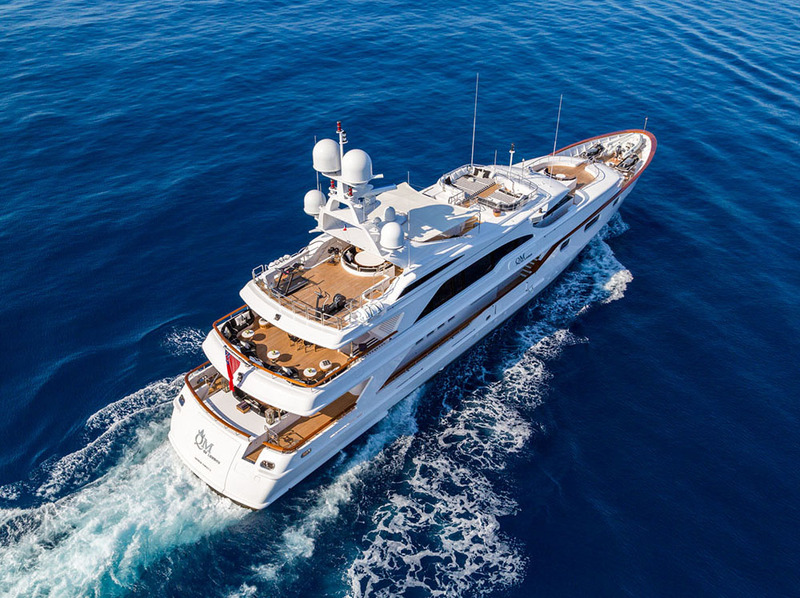 Superyacht AIR received various refits over the years (2006, 2013, 2015, 2017), keeping her in an immaculate shape, always offering only the best to her guests. 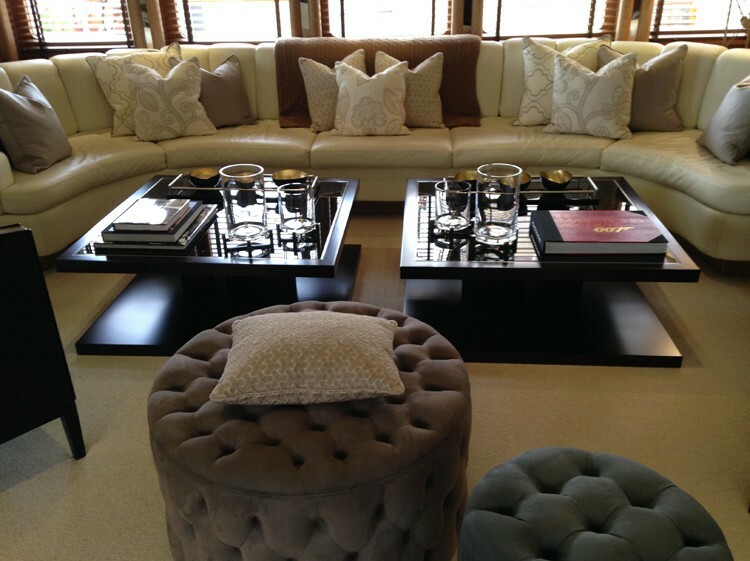 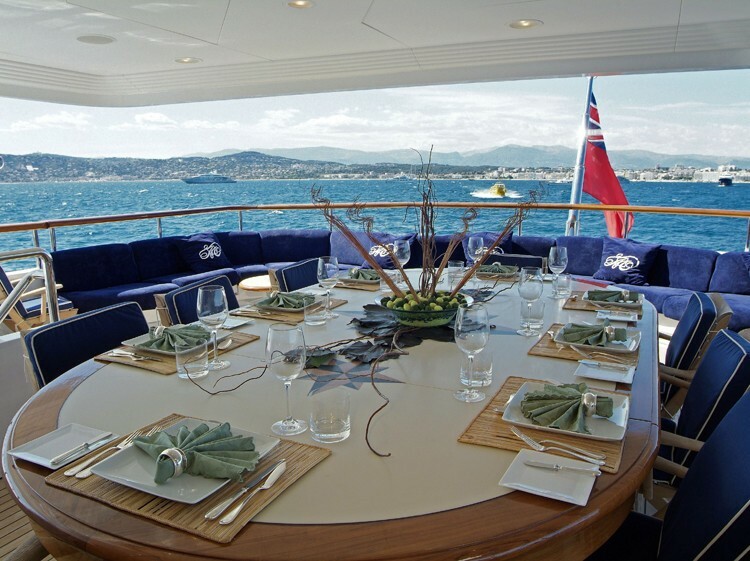 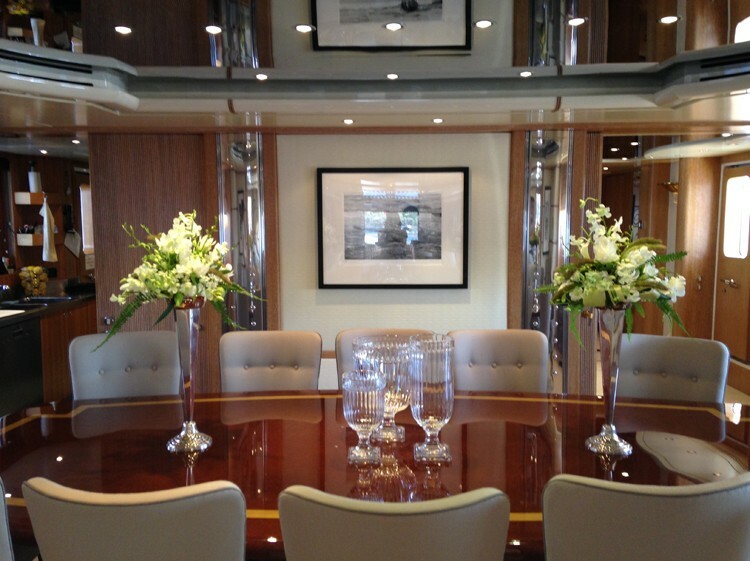 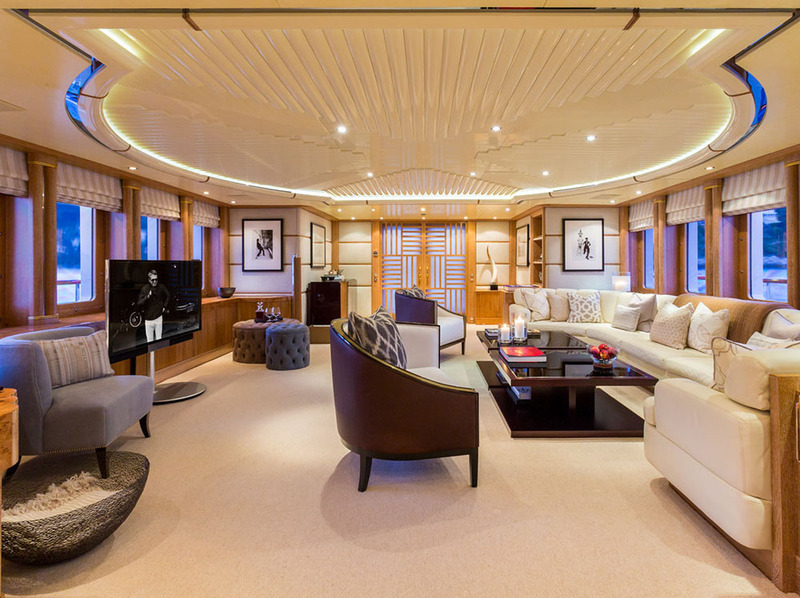 With interior design by Terence Disdale, she is able to accommodate up to 12 guests in 7 elegant suites and has a highly professional crew of 11. 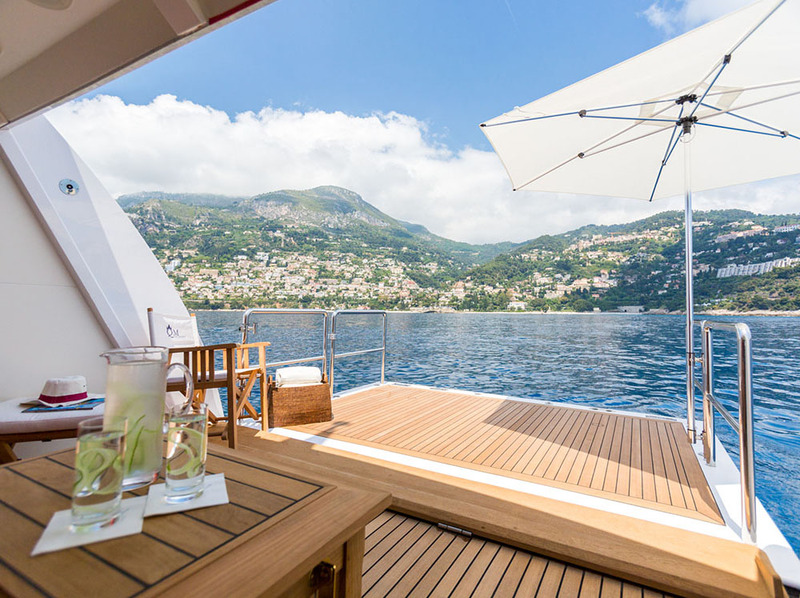 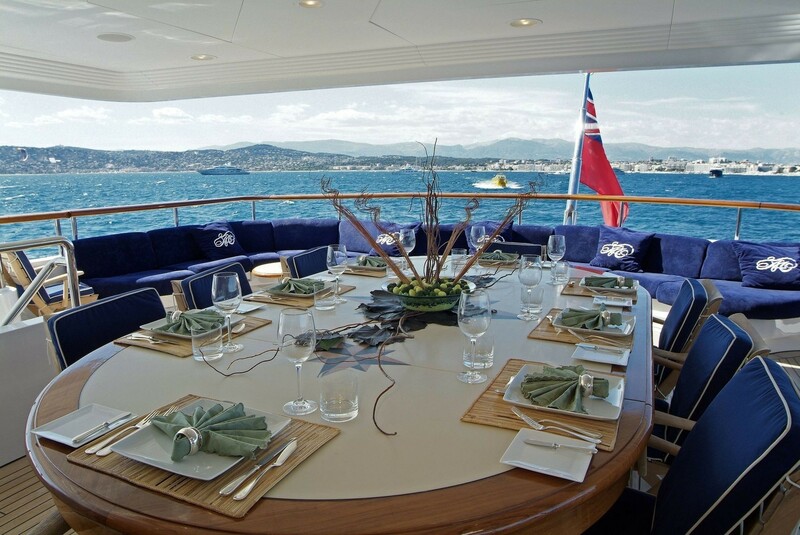 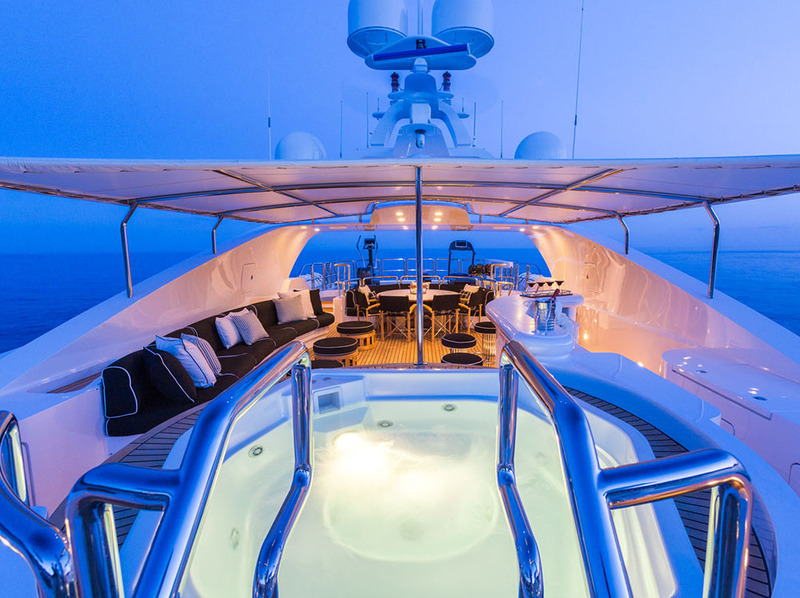 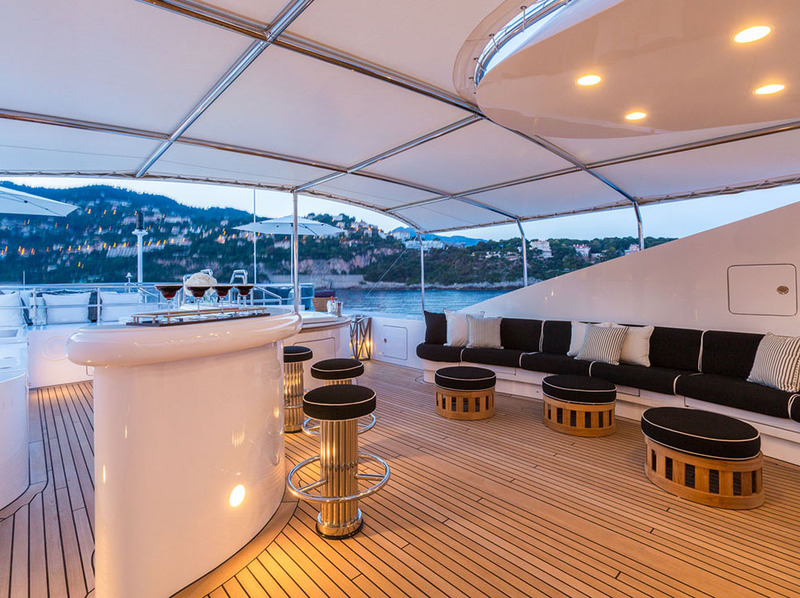 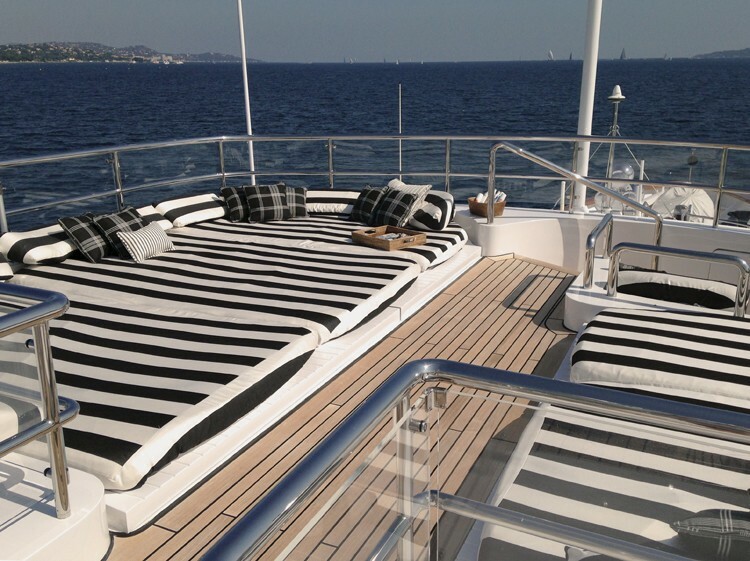 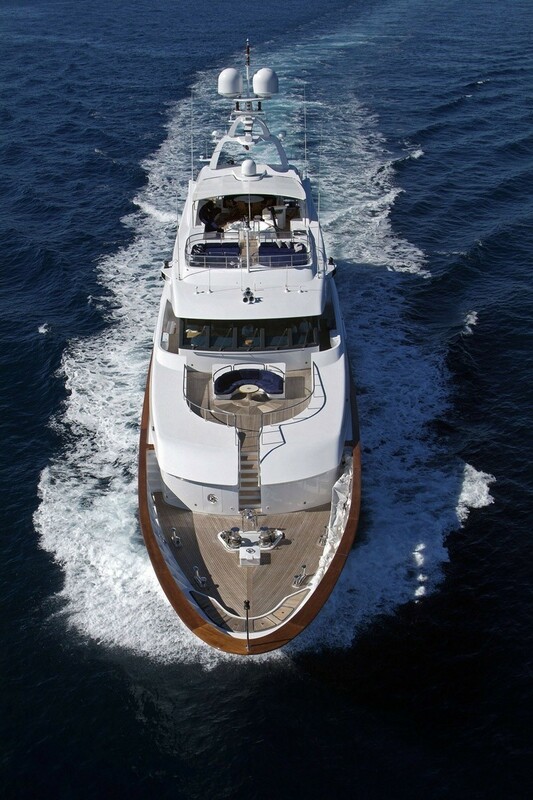 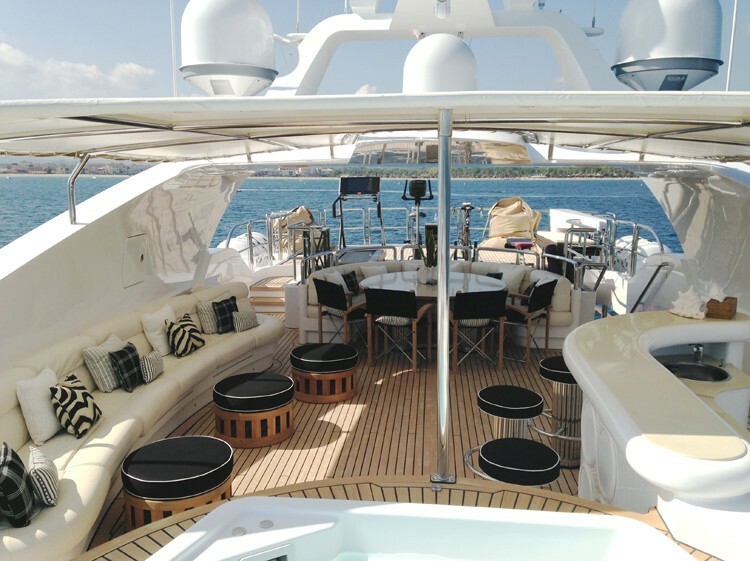 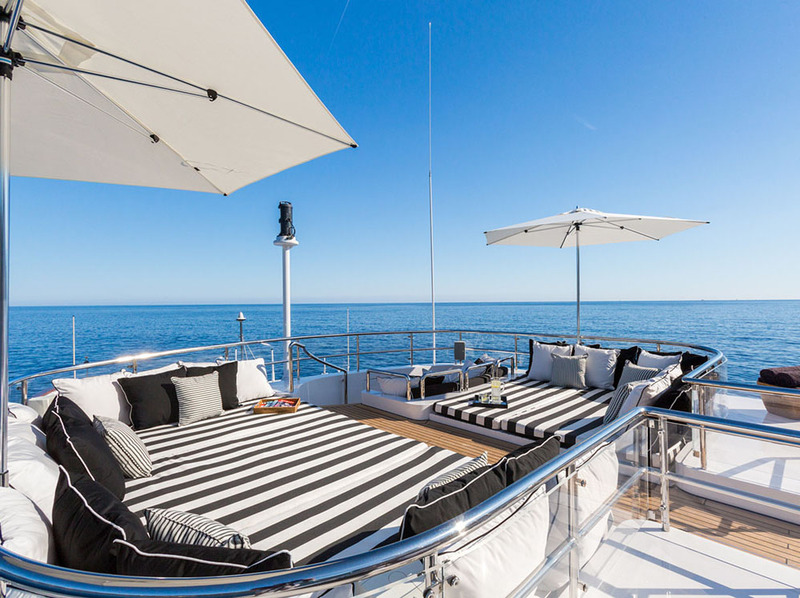 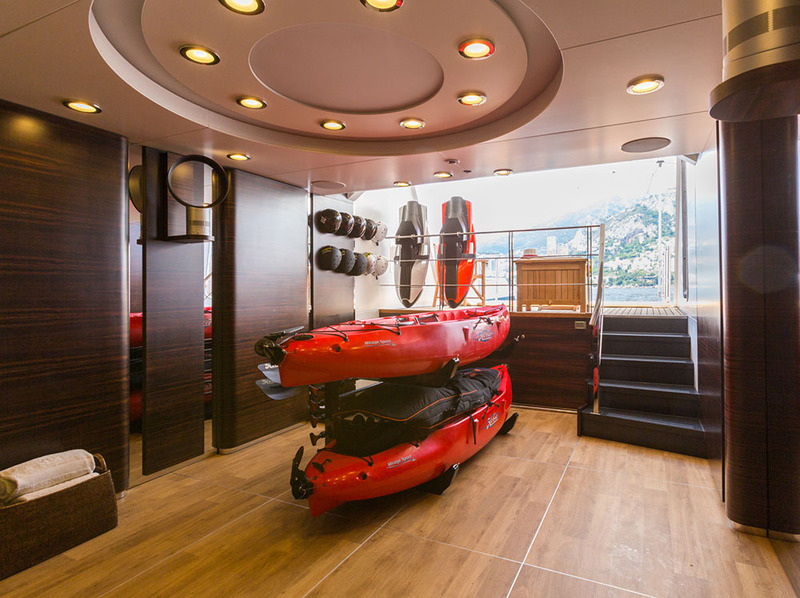 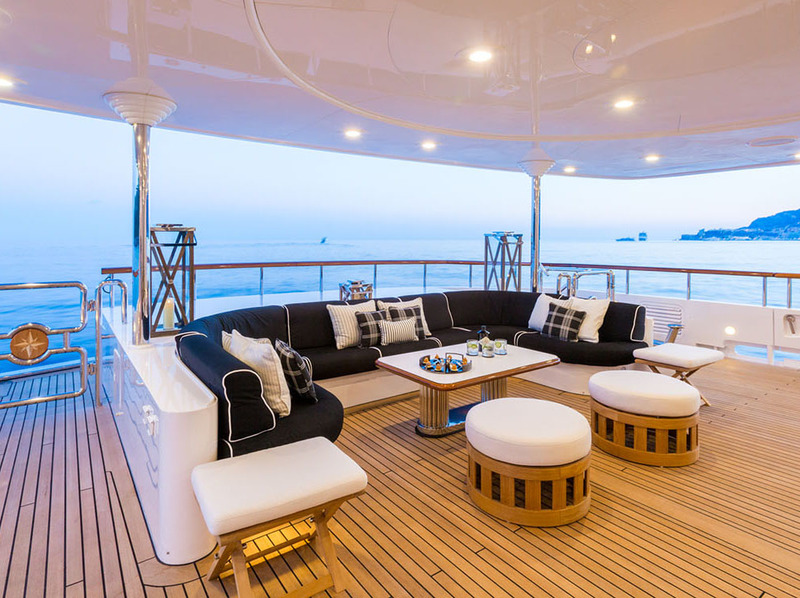 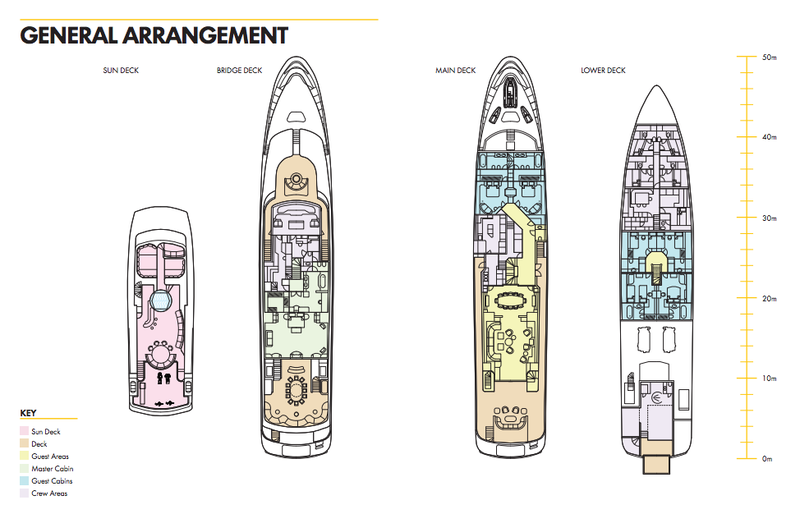 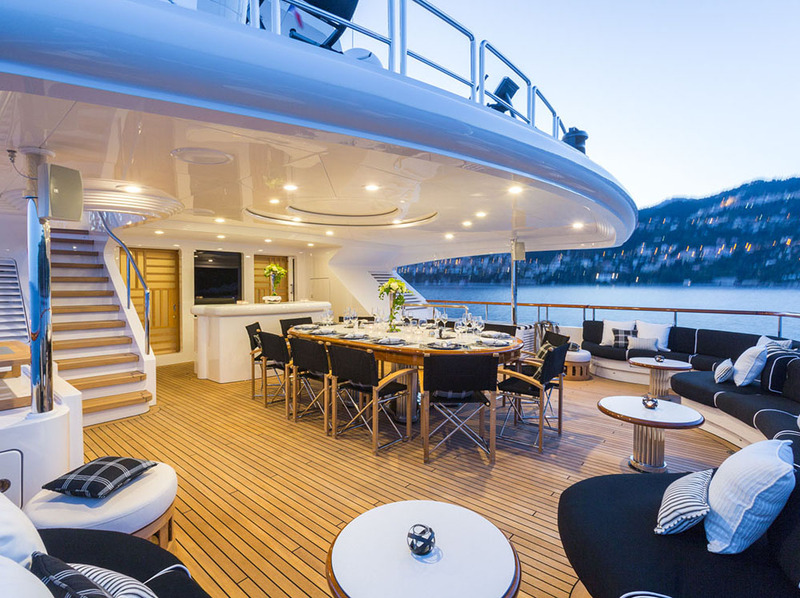 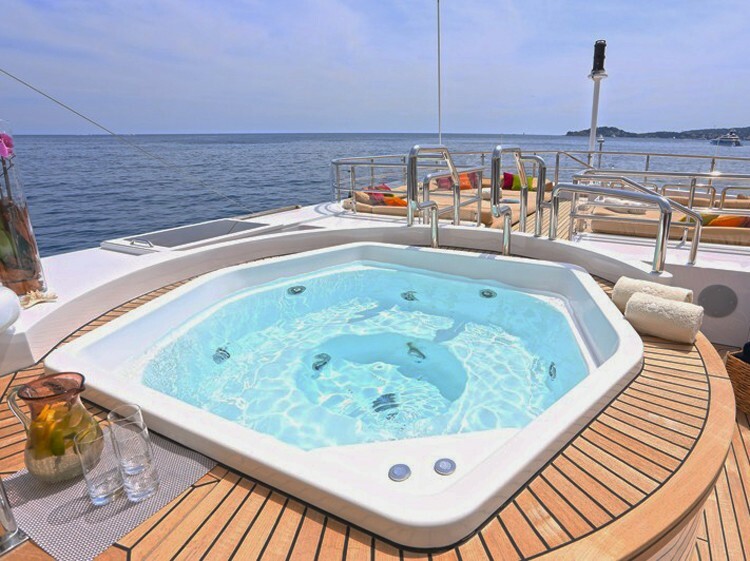 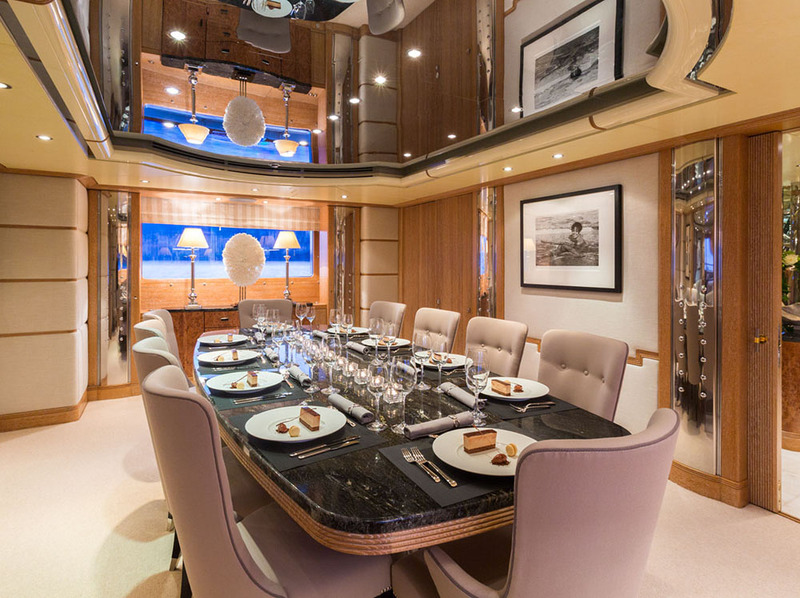 Charter yacht AIR has a unique seven-cabin layout, rarely seen on yachts of her size and those available for yacht rental. 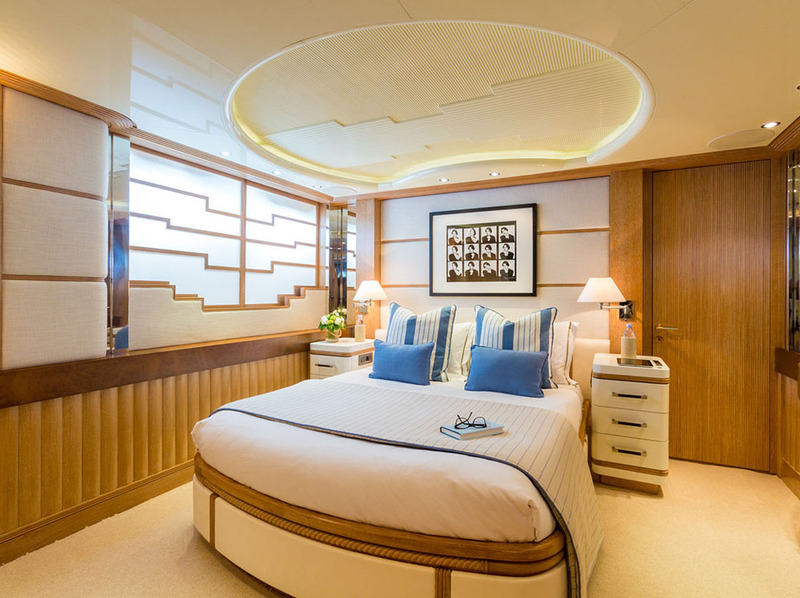 The accommodation is divided into one deluxe full-beam owner's suite, two gorgeous VIP suites and four elegant guest cabins. 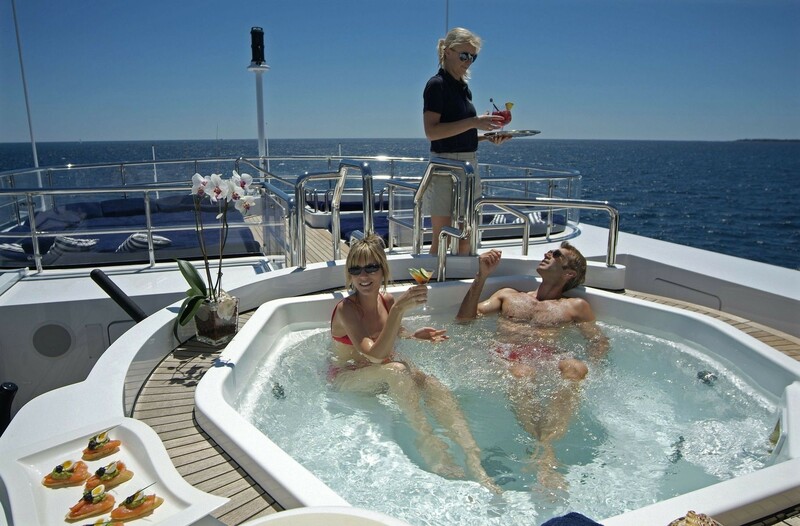 Eleven crew members are there to make sure everything runs smoothly and that you have the best holiday of your lifetime. 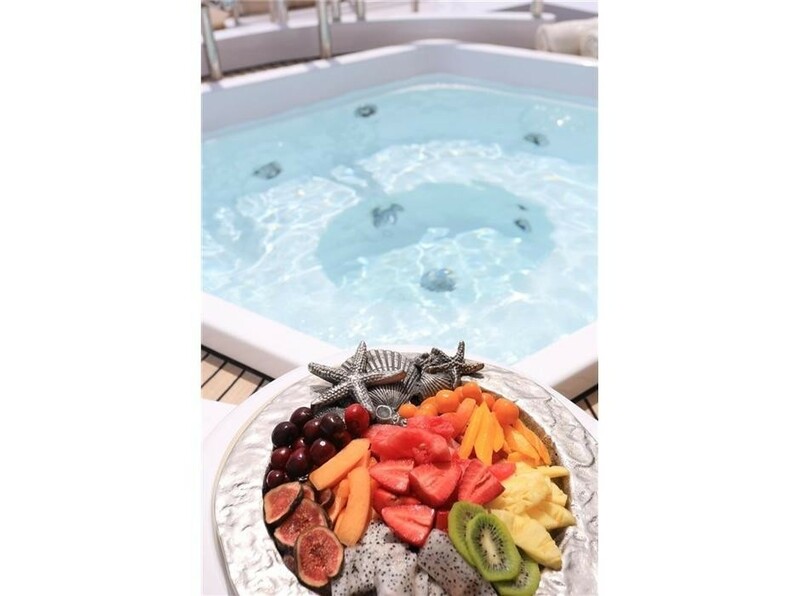 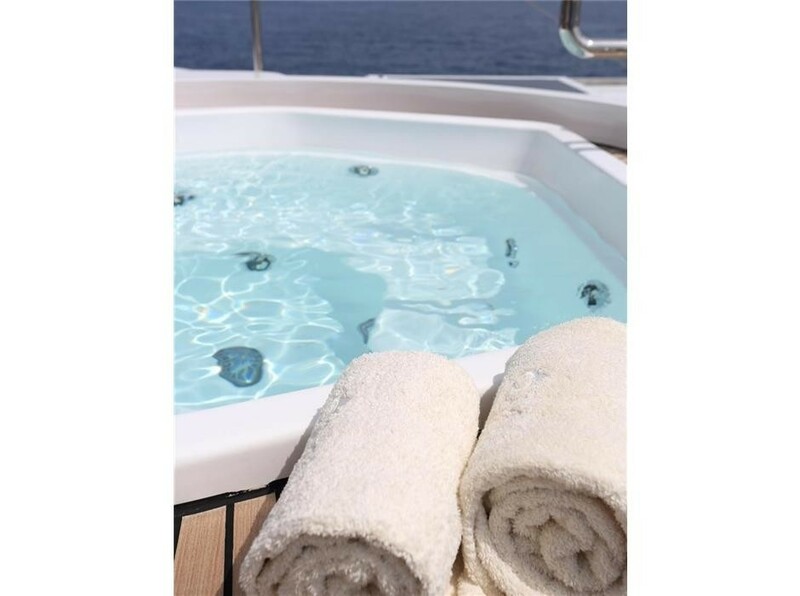 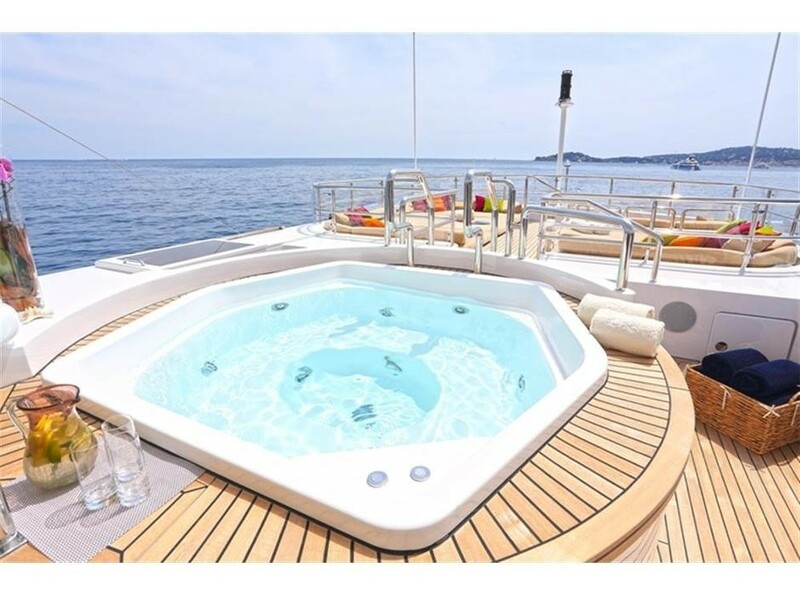 In addition to her spacious interior and exterior entertainment and relaxation areas, there is a masseuse, as well as yoga, flyboard and kitesurfing instructors amongst the crew on board luxury yacht AIR. 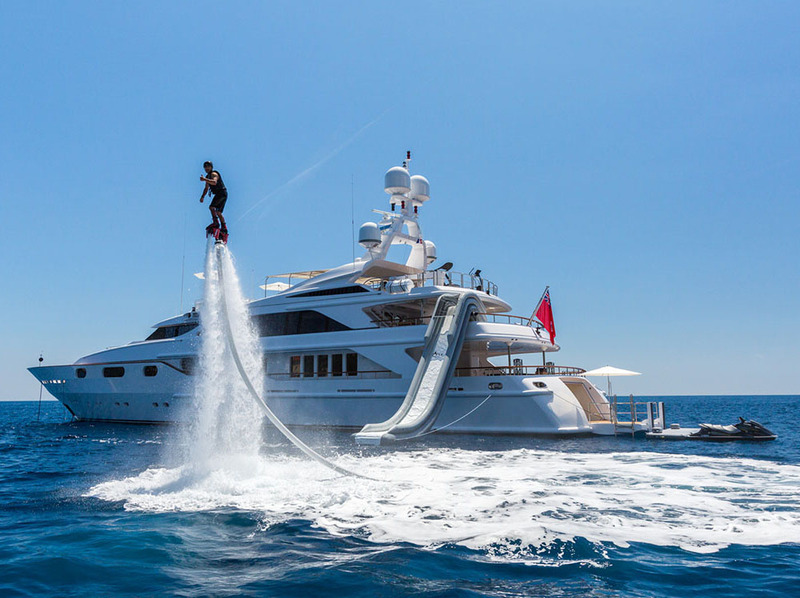 AIR has a 10m Scorpion chase tender as well as great water toys which include a super-fun waterslide, the popular paddleboards, a jetboard, a flyboard as well as a seabob. 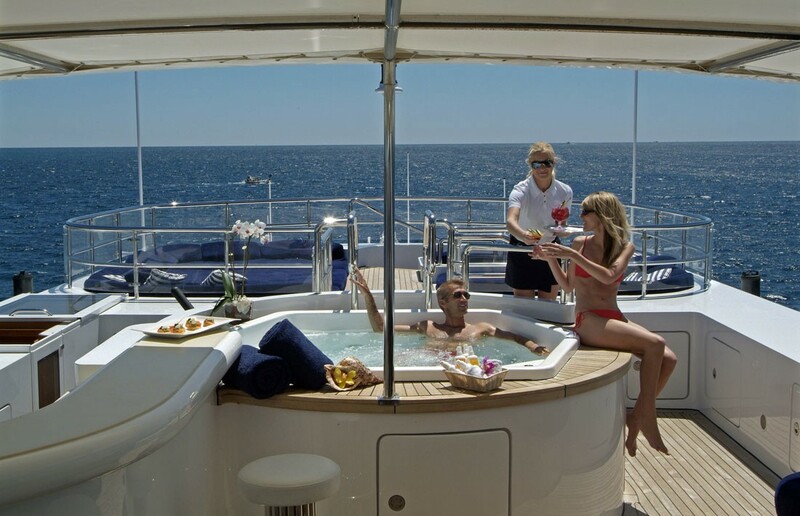 AIR also has an RYA accredited watercraft centre. 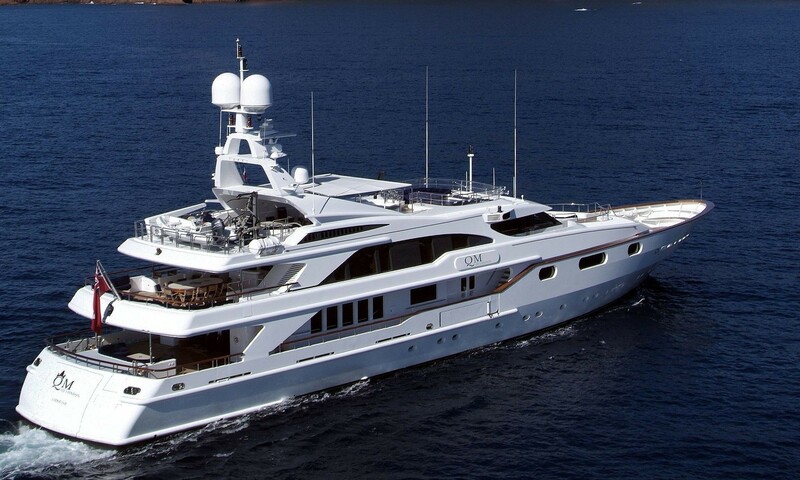 She is fitted with zero speed stabilisers for additional guest comfort. 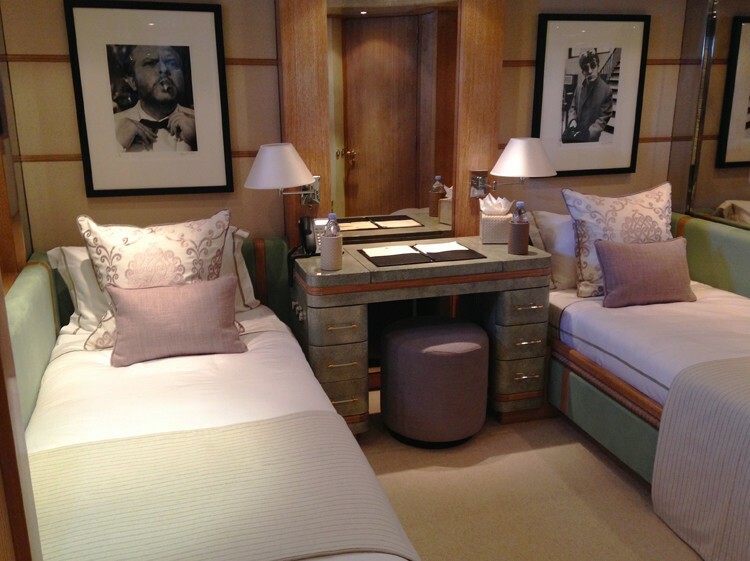 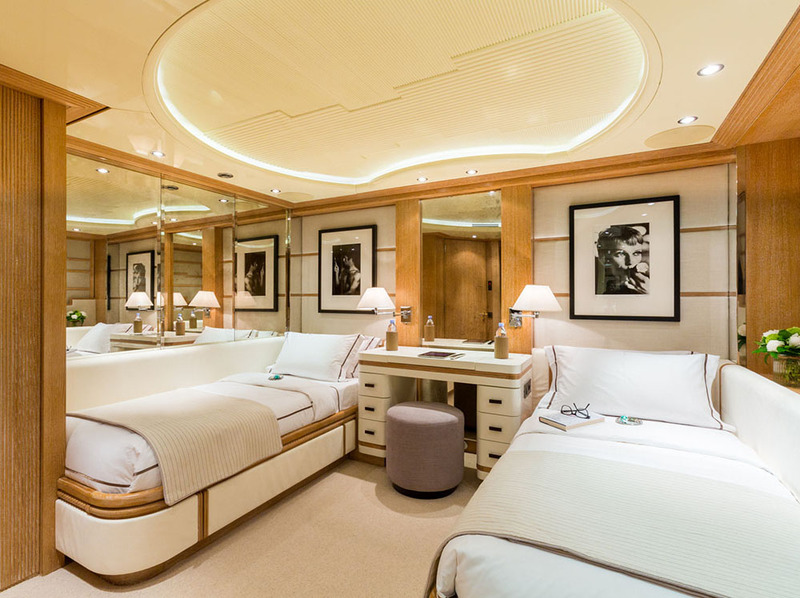 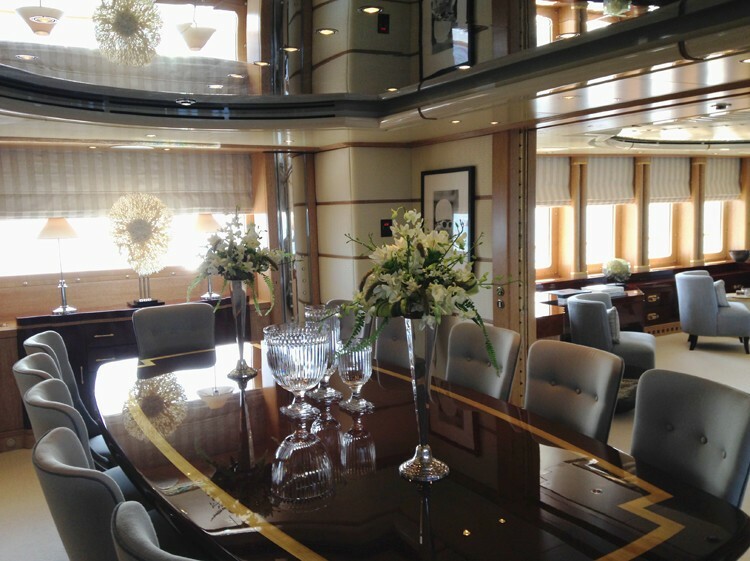 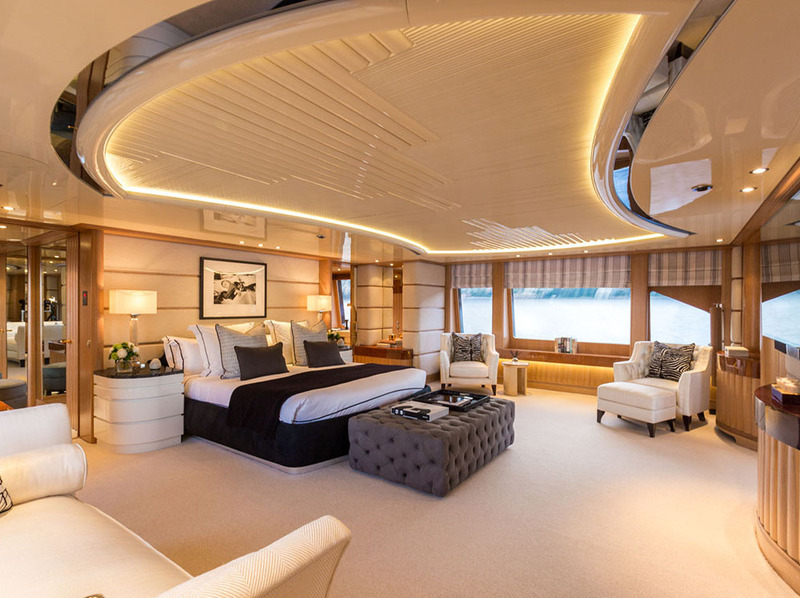 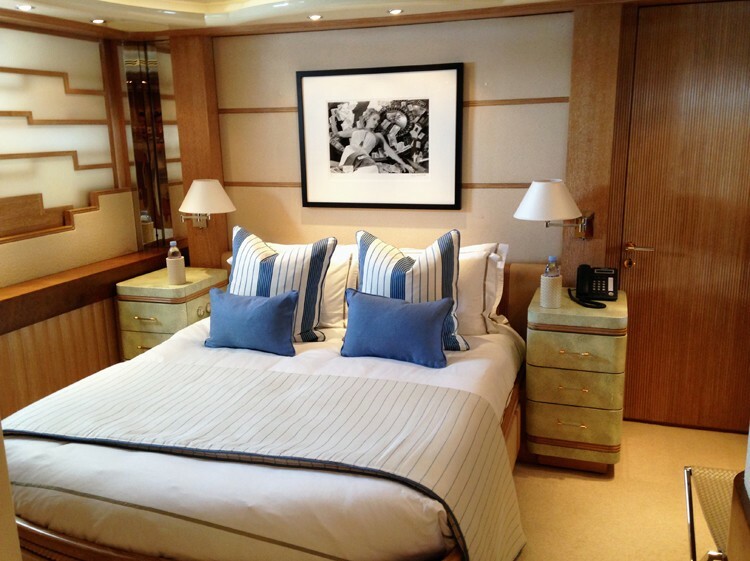 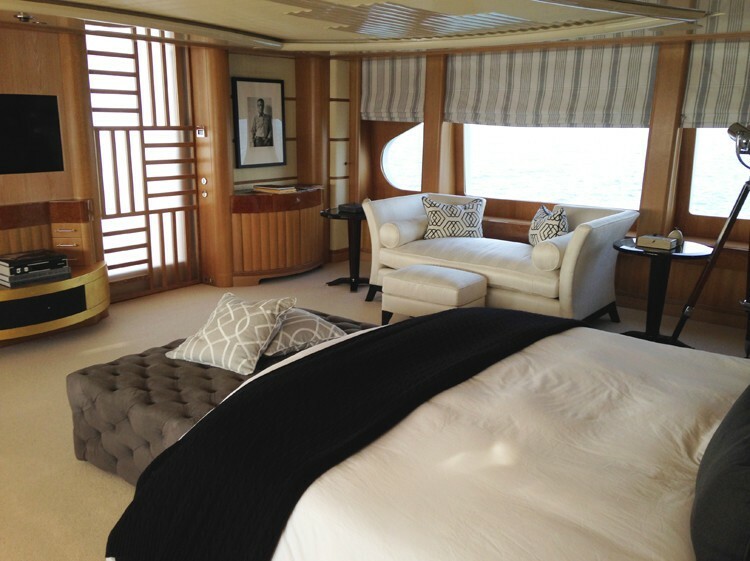 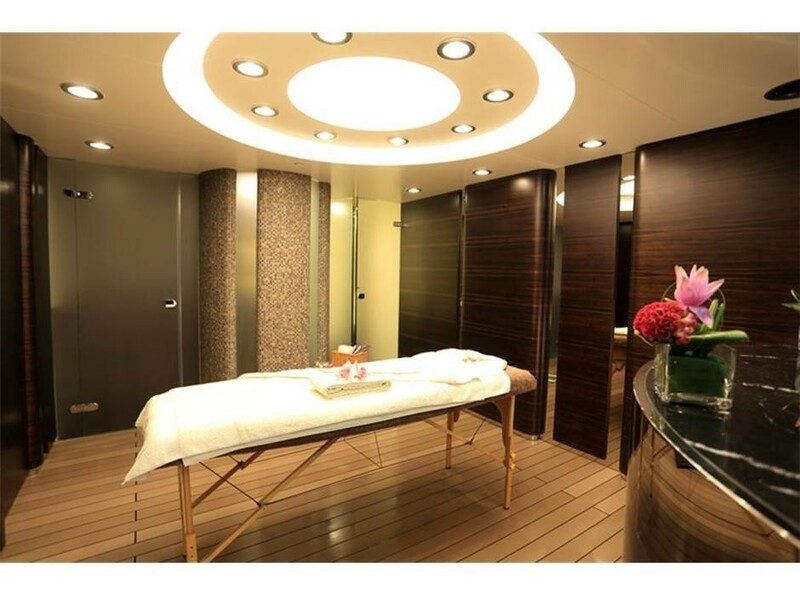 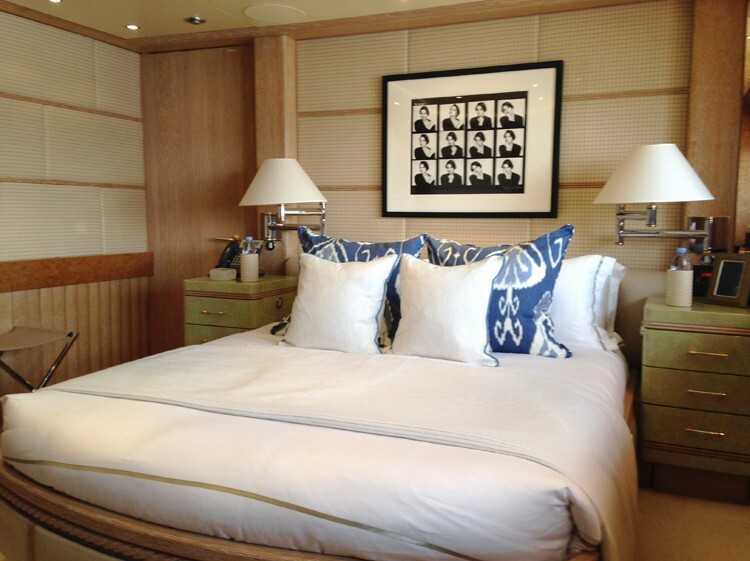 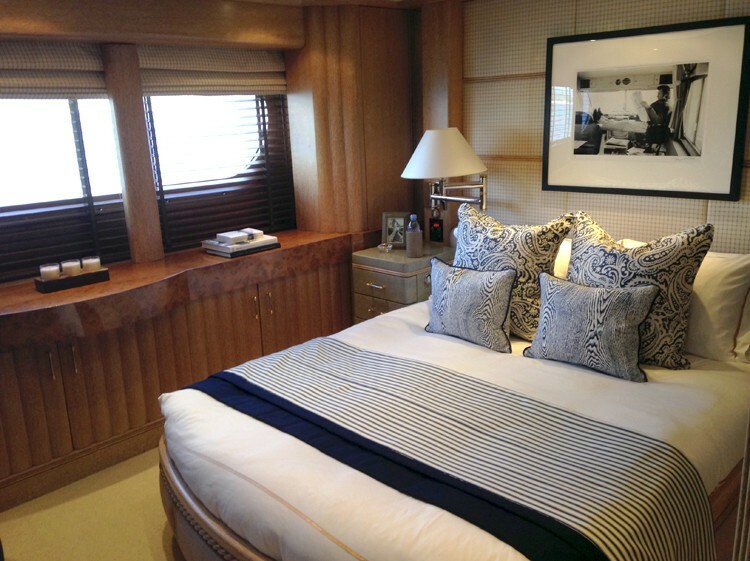 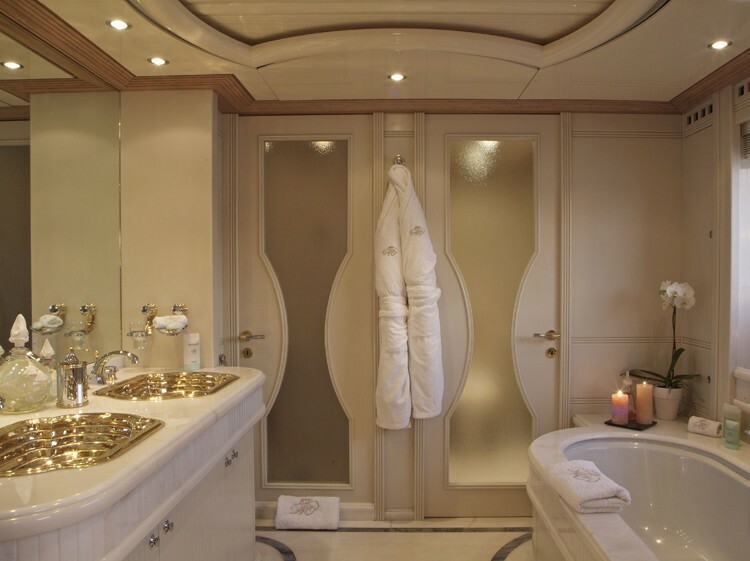 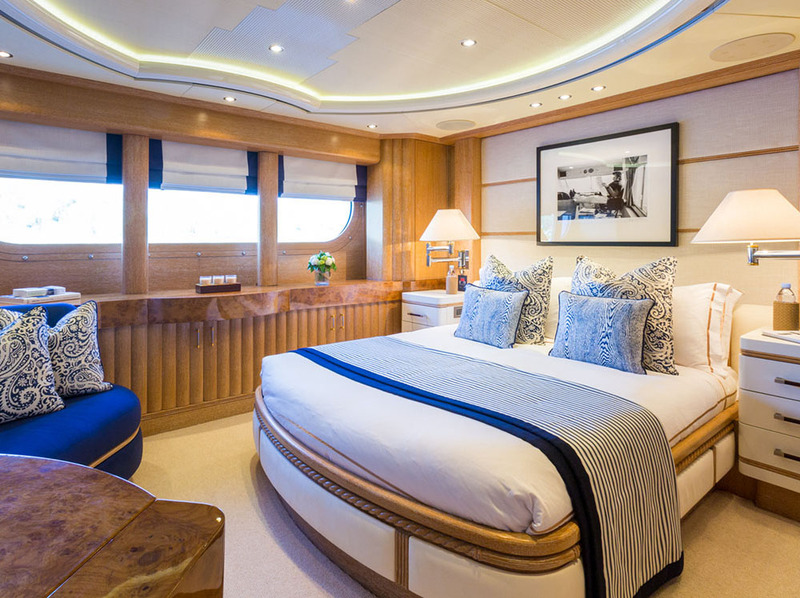 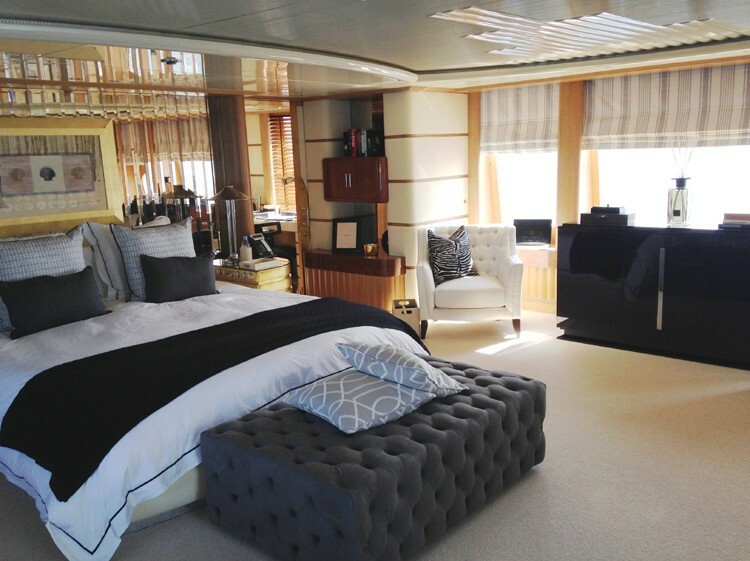 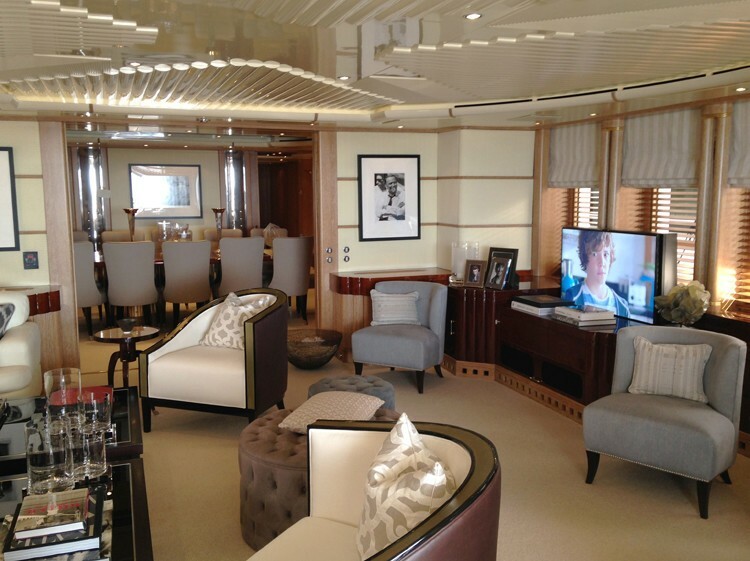 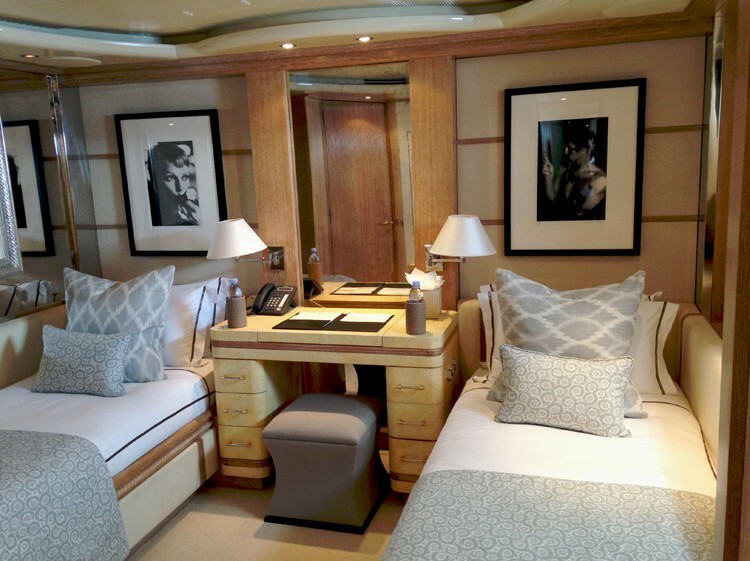 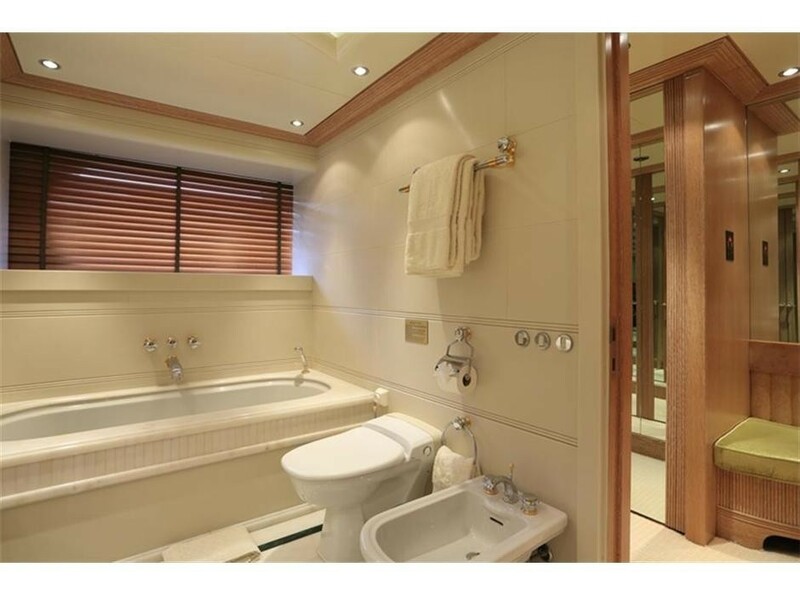 The large master suite is located on the bridge deck spreading the entire width of the vessel and featuring a king-sized double bed, a large TV as well as a private ensuite bathroom, study area and a lounge area. 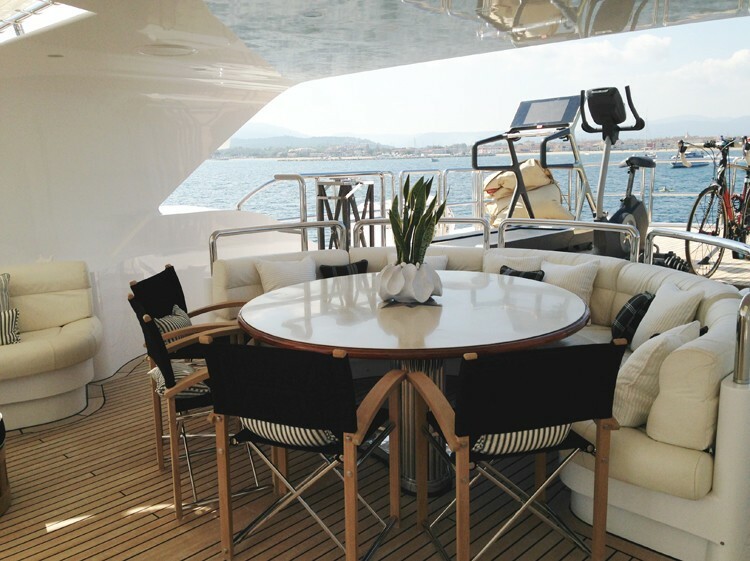 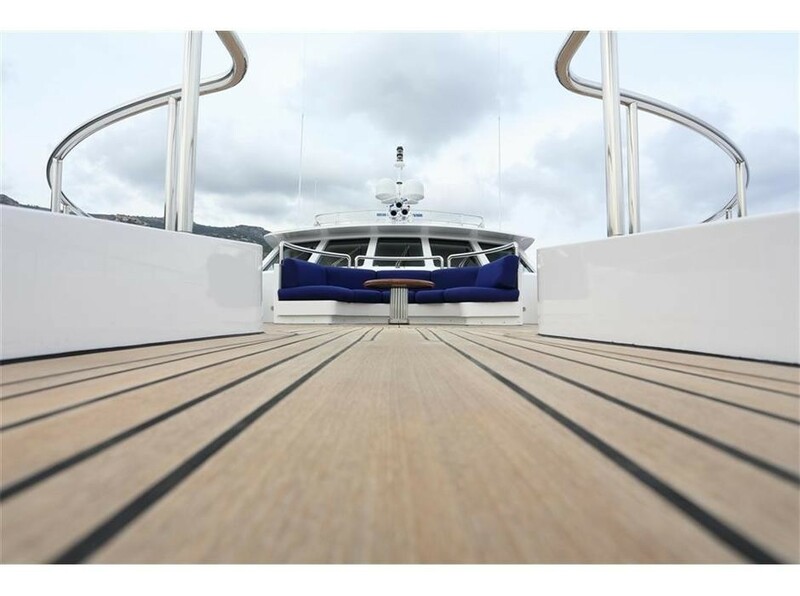 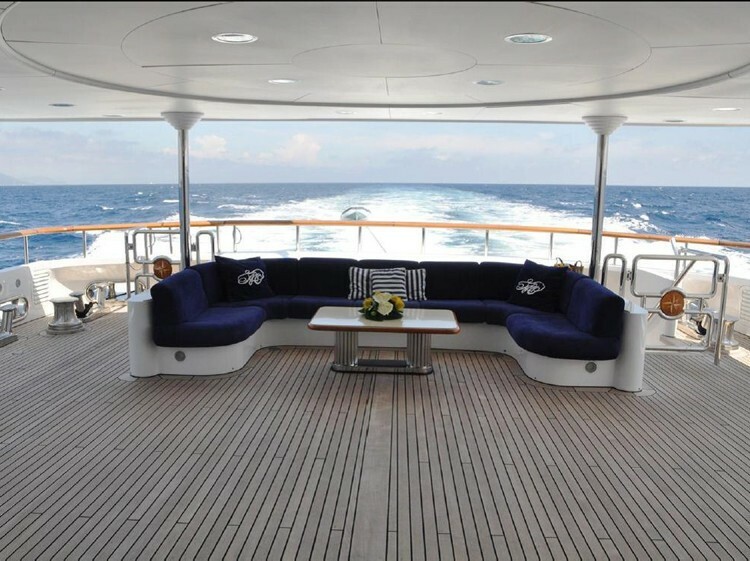 Aft of the master cabin is a spacious alfresco dining and seating area with bar and a curved settee. 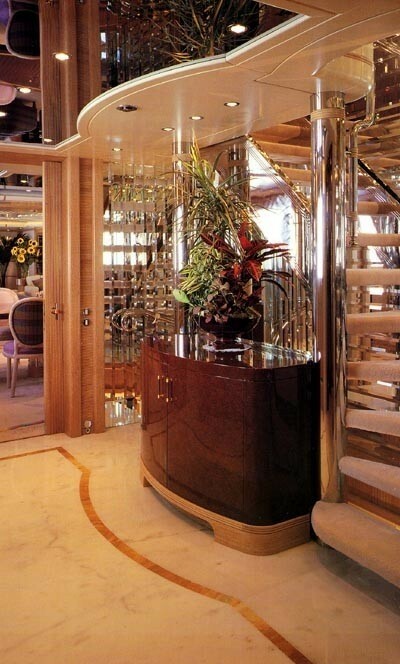 This area is accessed via sliding doors. 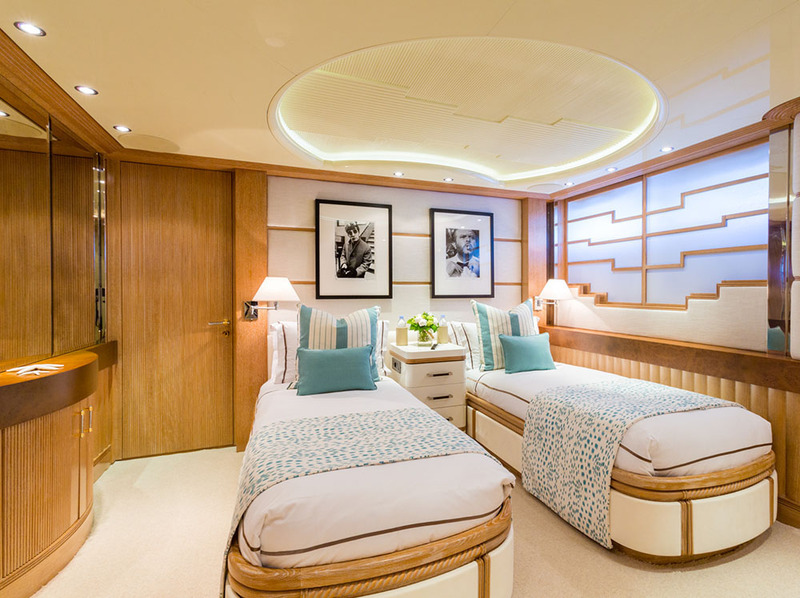 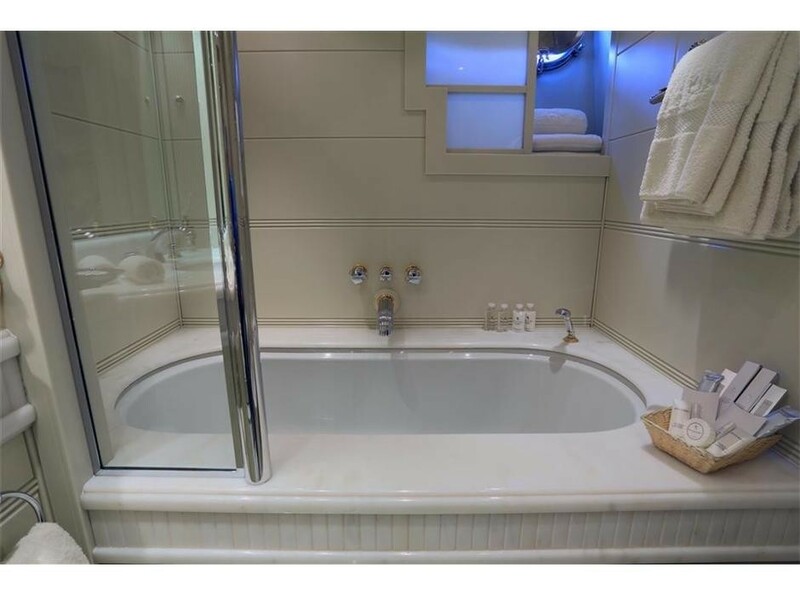 The main deck features two elegant VIP suites, both with queen-sized beds and ensuite bathroom facilities with either shower or bath. 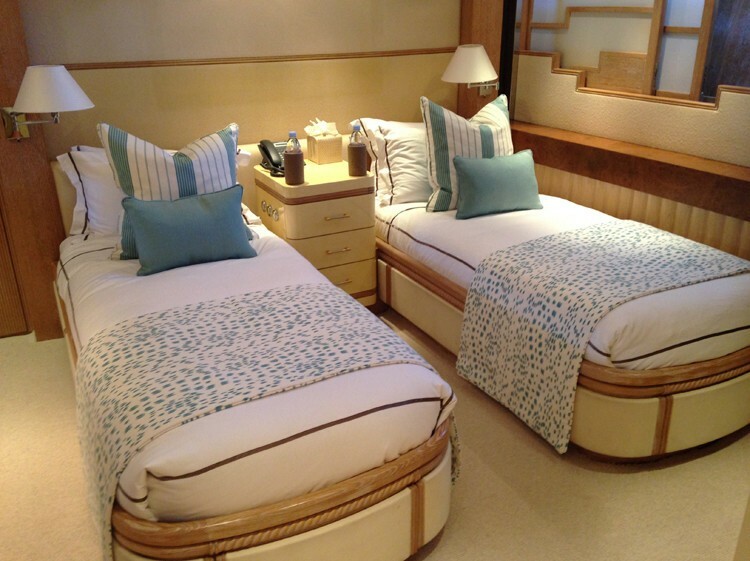 The lower is a home to four guest cabins, one of which is a double bed cabin and three are twins.